The all-new Toyota GR Supra, the fifth generation of Toyota’s legendary sports car and the first global GR model to be produced by TOYOTA GAZOO Racing, makes its world debut on January 14th 2019 at the North American International Auto Show in Detroit. The new Toyota GR Supra has been conceived as a sports car in its purest form, with no compromise that would take from the enjoyment of the driving experience. 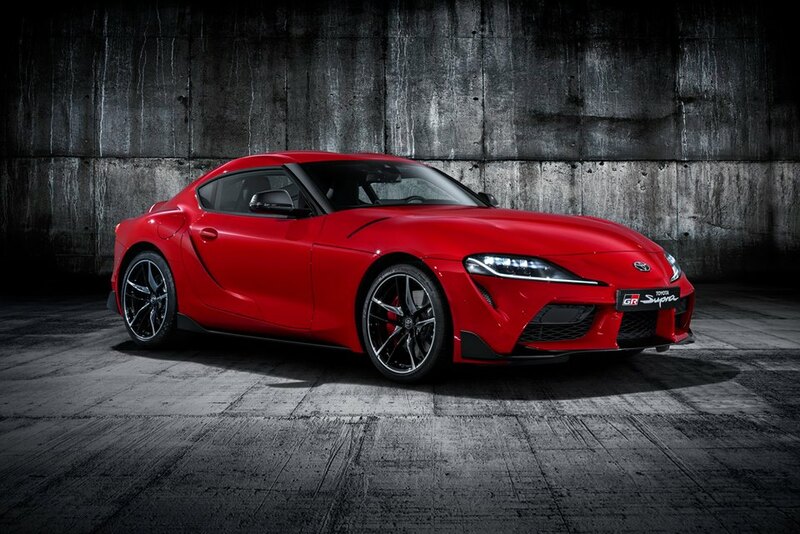 Chief Engineer Tetsuya Tada has adhered to the classic form of a front-mounted, straight-six engine driving the rear wheels, building on the heritage of Toyota’s past Supra generations and original 2000GT sports car. Driving enthusiasts can look forward to an exhilarating blend of power, agility and precision handling, achieved thanks to the car’s combination of a short wheelbase and wide track, light weight, low centre of gravity and highly rigid body. The 3.0-litre engine benefits from a twin-scroll turbocharger and produces 340 DIN hp and 500 Nm of torque. Coupled to an eight-speed automatic transmission, it is characterised by smooth and powerful acceleration, with large amounts of torque available across the full spectrum of engine speeds. TOYOTA GAZOO Racing was instrumental in honing the new sportscar’s performance, working extensively on the famous Nürburgring Nordschleife and surrounding roads in Germany in order to achieve the most agile, stable and rewarding handling. Further extensive testing was carried out on roads around the world. To be certain that the car delivered on its promise, Toyota President Akio Toyoda put it to the test at the Nürburgring in his role as a Master Driver before giving it the final green light. New Toyota GR Supra customer deliveries will start from late summer 2019. Toyota Supra Chief Designer Nobuo Nakamura gave his team a simple brief around the concept of ‘Condensed Extreme,’ purposely avoiding any emotive words so that they were free to express their vision of a pure and individual sports car in a truly original design. “With Chief Engineer Tada pursuing driving pleasure, I knew that my mission was to create a design that would be visually and physically exciting to sports car fans,” he said. “By using a straight-six front engine, rear-wheel drive layout – something rarely seen in today’s cars – I was able to reach something beyond Toyota’s boundaries.” In the finished design, the ‘Condensed’ theme is evident in the relationship between the Toyota GR Supra’s large-diameter tyres, short wheelbase and overall length. It’s notable that the wheelbase is in fact shorter than in the GT86 coupe, and the tyres are larger. ‘Extreme’ is interpreted in the car’s wide stance, with tight cabin proportions and a broad tread, contributing to a high level of manoeuvrability and stability. The cockpit is designed to put the driver at the centre of the action and it’s directly influenced by the lay-out found in single-seater race cars. The low, slim horizontal dashboard maximises the forward view through the windscreen, helping the driver place the car with precision in high-speed driving, while the principal controls are tightly grouped for quick and easy operation. The instrument panel, centre console and door trim combine in a seamless design that gives the cockpit a strong, unified feel. The new Toyota GR Supra’s seats have a racing-influenced design that ensures comfort at all times and excellent support, in particular if the car is being used on-track. The performance heart of the new Toyota GR Supra is its 3.0-litre in-line six-cylinder engine, producing up to 340 DIN hp and 500 Nm of torque. It is fitted with a twin-scroll turbocharger, high-precision direct fuel injection and continuously variable valve control that secure segment-leading torque performance from very low revs. The unit is powerful, well-balanced, smooth and light revving, with an exhilarating acceleration feel. All versions of the Toyota GR Supra sold in Europe will be fitted with an active differential that operates both when accelerating and decelerating and can seamlessly adjust from zero to full, 100% lock, with instant response. A dedicated ECU monitors a wide range of inputs, including steering wheel, throttle and brake pedal operation, engine speed and yaw rate, for appropriate triggering of the actuator. High targets were set for the handling performance and these were achieved in a development programme led by TOYOTA GAZOO Racing that included extensive testing on a wide variety of challenging roads worldwide. The on-road testing also included sessions on race tracks, including the Nürburgring Nordschleife. High structural rigidity (greater even than the Lexus LFA supercar), a centre of gravity lower than the GT86 coupe and ideal 50:50 front/rear weight distribution were fundamental to achieving the dynamic goals, but required bold engineering decisions. For example, the desired weight balance was gained by moving the engine as far as possible rearwards, which introduced new production challenges. The Toyota GR Supra is the first GR model to be produced by TOYOTA GAZOO Racing for the global market. TOYOTA GAZOO Racing is the umbrella organisation for Toyota’s global motorsports programme and in the past year has won both the Le Mans 24 Hours in the FIA World Endurance Championship and Manufacturers’ Championship in the FIA World Rally Championship. Its work is based on three pillars: developing people through participation in motorsport; creating fans through the excitement of motorsport; and applying the knowledge gained from motorsport to make ever-better cars for the road that are fun-to-drive. There will be 900 new Toyota GR Supra owners in Europe during the first year of the car’s launch and, as the first to reserve this pure new sports car, they will enjoy a number of special benefits. In recognition of their enthusiasm for the return of the Supra name, they will be given access to an exclusive experience programme and money-can’t-buy rewards in the lead-up to the delivery of their car, from late summer 2019. Call Crossings Motor Centre on 045 897589 to find out more about the returning Supra. "The Supra is one of the biggest legends and most-loved cars in Toyota history and there is huge excitement in its return. The new Supra has been created with pure performance and driving enjoyment in mind and with a stunning design that builds on previous generations of the car. We are sure that Supra fans will be enthused with the return of the Supra, and that it will help introduce a new generation of fans to the Legend."